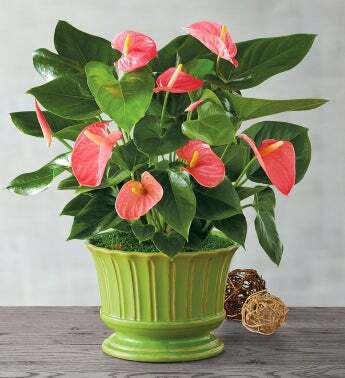 Sometimes known as the Flamingo Flower, the pink anthurium is a uniquely shaped and beautiful plant gift. Firm, dark-green leaves fan horizontally from the sides, while pink, petal-like spathes rest below the flowery spears that rise from the stems. This interplay of colors and shapes creates a captivating plant gift that will be cherished for its distinctive beauty. This bright flower comes planted in a green stoneware container to complement its brilliant petals, which can be reused should you decide to re-plant the Anthurium in your garden or another planter.